We chose Chardonnay because it’s possible to get drinkable Chardonnay at pretty low prices, which is not generally the case with red wines. The pairing was done with grilled salmon, basmati rice and fresh corn on the cob so the Chardonnay pairing should have been a good. All four bottles were served chilled. All four were in light green, flat bottomed bottles and all but the Charles Shaw brand was stoppered with identical man-made corks (e.g., they had the same printed design on the sides of the corks and the same silver foil wrap on the top of the bottle). In addition, all four were an identical pale straw color. 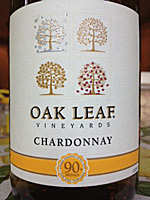 Oak Leaf, vinted and bottled by Oak Leaf Vineyards; Livermore and Ripon, California. Labeled American and non-vintage. Tasting result: Very slight fruit bouquet as the wine warmed up. A sweet citrus (grapefruit) taste and a slightly bitter finish. 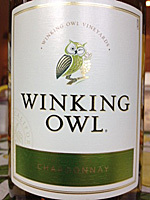 To us this was most like box-wine labeled Chardonnay, but at less than $3.00 would classify it as OK.
Winking Owl, vinted and bottled by Universal Wine Network; Ripon and Livermore, California. Labeled American and non-vintage. Tasting result: Hints of floral aromas in the bouquet. Thin pear taste with slight hints of oak and damp earth that carried into a finish that was the longest of the four. 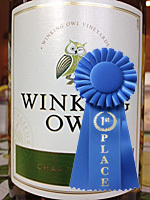 As this wine warmed it was the only one of the four that had any Chardonnay taste. If pressed, we would have to say this was the one we thought was the best and clearly for less than $3.00 it has to be called a bargain. Would we buy it again? Probably not, because for a few more dollars you can get far better mass-produced Chardonnay (e.g., Meridian or Columbia Crest Grand Estates). However, if your looking for the best low priced Chardonnay this is the one to get. 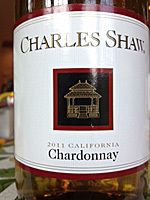 Charles Shaw (Two-buck Chuck). Actually it’s no longer two bucks and should now be called “Three-buck Chuck”. This is probably one of the best known “cheap” American wine brands. Cellared and bottled by Charles Shaw Winery; Napa and Sonoma, California. This label says it’s California wine and a 2012 vintage. Tasting result: Very, very thin aromas. VERY UNIQUE pungent fruit taste that is nothing like Chardonnay. A fairly long finish that is bitter. For us this was the one that went to the bottom of the list very quickly. Three Wishes. The Whole Foods low cost wine label. 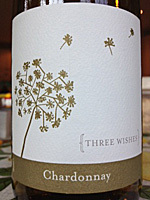 Vinted and bottled by Three Wishes Vineyards; Livermore and Ripon, California. Labeled American, non-vintage. Tasting result: Very light flora aromas. Thin flat taste (almost bland) and a nondescript finish. Although it has similarities with the Walmart Oak Leaf and Aldi Winking Owl, it lacks any character, and just gets lost in the group. In the end all were drinkable and might be OK if you had nothing better available. And, maybe the best thing we can say is that at $3.00 they produce a very inexpensive buzz!! !